An artist's impression of a giant space rock slamming into Earth 65 million years ago near what is now Mexico's Yucatan Peninsula. A consortium of scientists now says this was indeed what caused the end of the Age of Dinosaurs. The timing just isn't right, according to the new study. Baptistina first came under suspicion in some astronomers' minds after a 2007 study. In that work, researchers used visible-light data from ground-based telescopes to estimate the size and reflectivity of the Baptistina "family" — the pieces of the broken-apart space rock. With these estimates in hand, researchers determined that the big space rock likely broke apart about 160 million years ago. 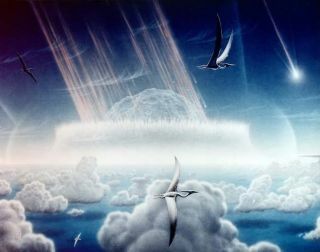 That would have given plenty of time for the Baptistina family asteroids to disperse to different and potentially dangerous orbits by the time of the dino-killing impact. Since that study, however, various researchers have gathered more information that cast doubt on the Baptistina asteroids as suspects. And the new study may finally rule the family out altogether, researchers said. Scientists think that a giant asteroid, which broke up long ago in the main asteroid belt between Mars and Jupiter, eventually smashed into Earth and caused the extinction of the dinosaurs. Data from NASA's WISE mission likely rules out the leading suspect, a member of a family of asteroids called Baptistina. WISE surveyed the entire sky twice in infrared light from January 2010 to February 2011. The telescope catalogued more than 157,000 asteroids in the main belt between Mars and Jupiter and discovered more than 33,000 space rocks. WISE also measured the size and reflectivity of 1,056 members of the Baptistina family. And these measurements were more accurate than previous efforts, leading in turn to more accurate estimates of the asteroid family's age, researchers said. The new observations suggest that Baptistina broke apart just 80 million years ago, not 160 million years ago as some scientists had thought. "This doesn't give the remnants from the collision very much time to move into a resonance spot, and get flung down to Earth 65 million years ago," said study co-author Amy Mainzer, of NASA's Jet Propulsion Laboratory (JPL) in Pasadena, Calif. "This process is thought to normally take many tens of millions of years." Though WISE wrapped up its operational life in February 2011, researchers will continue to use its observations to map out the solar system's space rocks. They want to get a better handle on where asteroids came from — and where they may be heading. "We are working on creating an asteroid family tree of sorts," said study lead author Joseph Masiero of JPL. "We are starting to refine our picture of how the asteroids in the main belt smashed together and mixed up."